The form sprinted across the room so spryly, revealed the dagger so rapidly, the coach didn't have time to react. The winningest coach in all of college football is stabbed to death in his estate in Coral Gables. People assume someone on the coach’s long list of enemies is responsible for the murder. But a telltale calling card left on his corpse reveals a far more sinister truth: he was slain by an intimate who was secretly connected to a cult planning a horrific event in South Florida. What form of terror is The Organization concocting? And just how did the coach interfere with the group's plans? Once again, authorities ask Dalton Lee and his team to help them solve those riddles before The Organization can launch its wave of treachery. From the colorful Art Deco hotels of South Beach, to the vibrant street life of Little Havana, to the mysterious gardens of the Vizcaya Museum, Murder Becomes Miami is a chilling, haunted-house ride that keeps readers guessing to the very end who among the viper's nest of suspects is the murderer in hiding. Unfortunately, it's right when Lee and his team pinpoint the serpent that the cult's hideous plot begins to unfold. Later that night, in his billowy dream, Vic Valenzuela was floating. Not on some luxurious yacht, but on an elegantly simple, streamlined schooner with masts made of gold and sails spun from silk. Across from him reclined a woman half his age, sporting languorous legs and oversized sunglasses. Maybachs, most likely, or maybe Chopard De Rigo. She gazed not at him but at some point on the horizon; her tresses stretched straight out behind her as if it were they, not the sails, that were propelling the boat forward. He extended his right arm over the side of the boat and dipped two fingers into the water . . . felt the liquid race over them, around them, and sometimes in-between them. He started to say something, decided not to. Instead, he studied the supple space at which her neck met her breastbone. Smooth, blemish-free, tight yet vulnerable. So very vulnerable, it had been . . .
Serenity reigned as the boat whisked along the surface of the ocean. Obviously there were breezes about, but he did not hear them. If there were seabirds nearby, they soared past in silence. The craft cut through the water like a knife slicing through . . . Suddenly, a click. He looked up. A sail detaching from the mast, perhaps? Then a scraping sound and a soft thud. He stirred, sighed, confronted darkness and warmth. The coach rolled onto one side, exhaled deeply, and tried to recapture the glide of the sailboat, reconnect with the scent of the sea. Another thud, slightly louder this time. He was fully awake now and detected another presence in the room. Raising himself onto his elbows, he blinked at the shadows to calibrate his vision. "Hey. What's going on? What are you doing here? Is something the matter?" The form sprinted across the room so spryly, revealed the dagger so rapidly, the coach didn't have time to react. The first stab was ill-aimed and ragged, grazing one ventricle at an obtuse angle. Blood first spurted like the arc from a water fountain, then settled into a low, steady gurgle as the winningest coach in all of football clutched the sheets and gasped for air. The second strike was more precise, severing a lung almost completely in two. The attacker first paused as the body sagged lifeless, then felt disgust surge up from within. One more for good measure, a shallow pierce that trenched the spleen nonetheless. The assailant took a couple of moments to survey the outcome before reaching into a pocket, extracting the calling card so important to the assignment, and tossing it unceremoniously onto the now-soggy body. Moments later, as the specter exited through the window it had entered, Victor Xerxes Valenzuela once again found himself floating out at sea. Only this time the ocean was a viscous crimson, the sky above, a lackluster black. Buy Murder Becomes Miami from our own independent publishing company, The Cornet Group. Buy Murder Becomes Miami for your Kindle from Amazon. 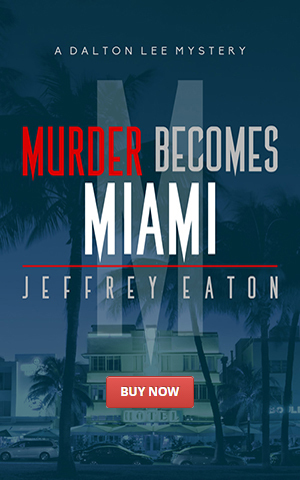 Murder Becomes Miami is coming soon from Apple for your iBook. Murder Becomes Miami is coming soon for your NOOK from Barnes & Noble. Murder Becomes Miami is coming soon for Kobo eReaders and apps. "Jeffrey Eaton's thrillers are chocked full of local color that makes readers feel like they are actually there. His books are fast-paced as all good thrillers should be and contains twists and surprises with regularity."